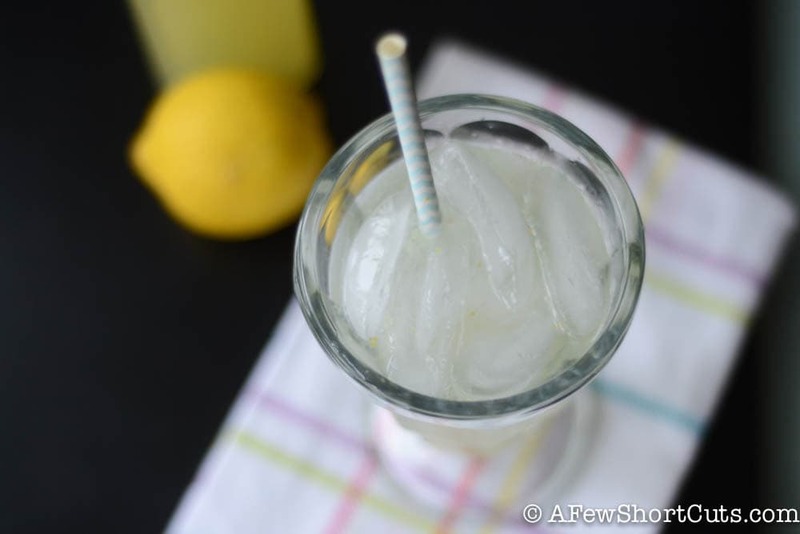 This Homemade Lemonade Syrup recipe makes the best fresh lemonade ever! 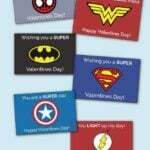 Perfect for gifts, and there are free printable labels! Whenever we go out to eat, my kids order lemonade to drink. They judge restaurants on the quality of their lemonade. LOL, The fountain stuff doesn’t cut it. Chick-Fil-A gets major bonus points for their fresh squeezed lemonade. They LOVE IT! Mom’s lemonade also gets two thumbs up, but I don’t stand in the kitchen squeezing lemons every day. 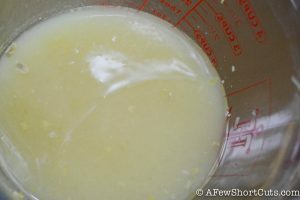 I make this Homemade Lemonade Syrup. It is a freshly squeezed lemonade concentrate that I keep in the fridge. Mix it with some water and ice and BAM! Fresh Squeezed Lemonade in seconds! I love making this and giving it as gifts too! Who doesn’t like lemonade?! Now my proud mama moment. 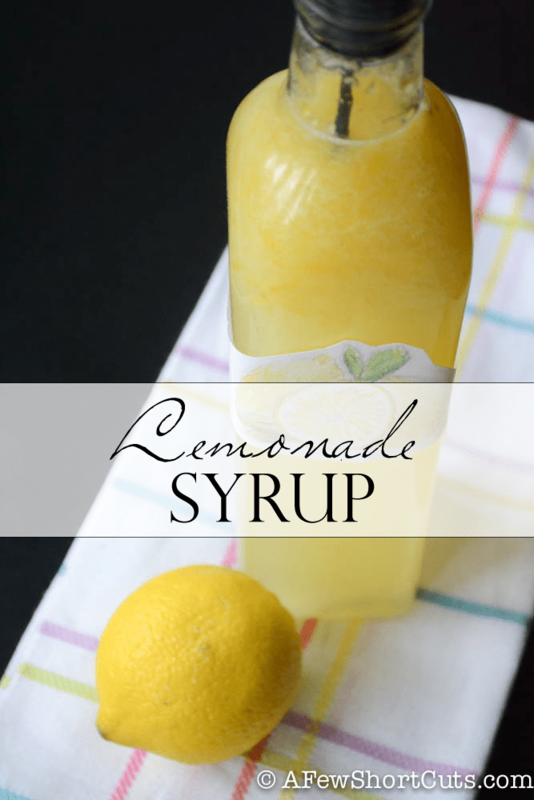 I told the kids I was going to make this lemonade syrup and post it on the blog. My 13-year-old artist decided she would make the labels for me. SHE DID AMAZING! 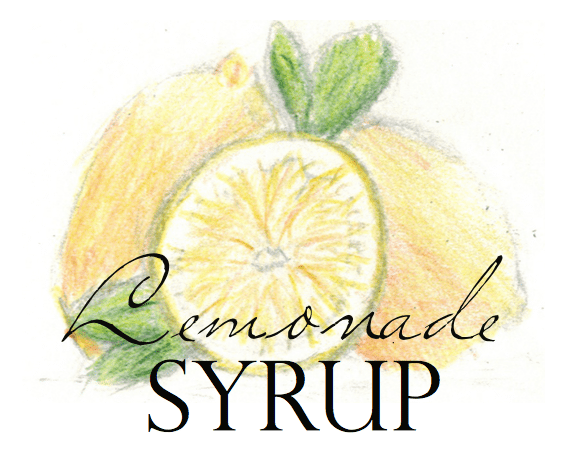 You can print your Lemonade Syrup Labels for FREE! 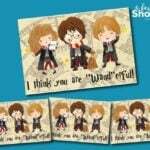 These are perfect if you decide to make it for gifts! There are six labels per sheet. Print them on sticker paper, or cut them in circles for the tops of Mason jars. Either way, aren’t they pretty? I am sure her art will be hitting an Etsy shop before the summer is over. She is a little entrepreneur in the making. You will need lemons. The more, the merrier! You are going to zest the lemons until you have about 2 tbsp of zest. It took about 2 -3 lemons to get enough zest. Now get to juicing. You will need 3 cups of lemon juice. That store bought concentrate just isn’t the same. Fresh is best. You can use half the recipe if you don’t have enough lemons. If a neighbor has a lemon tree, bake them a cake and hint that you really could use some lemons ;). Of course, take them a bottle of lemonade syrup when you are done. Once you have the lemons juiced, mix 3 cups of sugar with 1 cup of boiling water. Stir until the sugar has dissolved. Then mix with the Lemon Juice. You will end up with about 5 1/2 cups of liquid gold! Mix 1/3 – 1/4 cup of lemonade syrup with 6-8 oz of water to make the perfect glass of lemonade! Serving a houseful? For eight servings, combine 2 2/3 cups syrup and 5 cups cold water in a 2-qt. Pitcher; stir well. 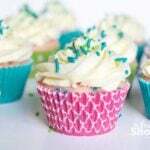 In a large heat-proof container, dissolve sugar in boiling water. Cool. Add fresh squeezed lemon juice and peel; mix well. For 1 serving, combine 1/4 to 1/3 cup lemonade syrup and 3/4 cup cold water in a glass; stir well. For 8 servings, combine 2-2/3 cups syrup and 5 cups cold water in a 2-qt. Pitcher; stir well. Wow! 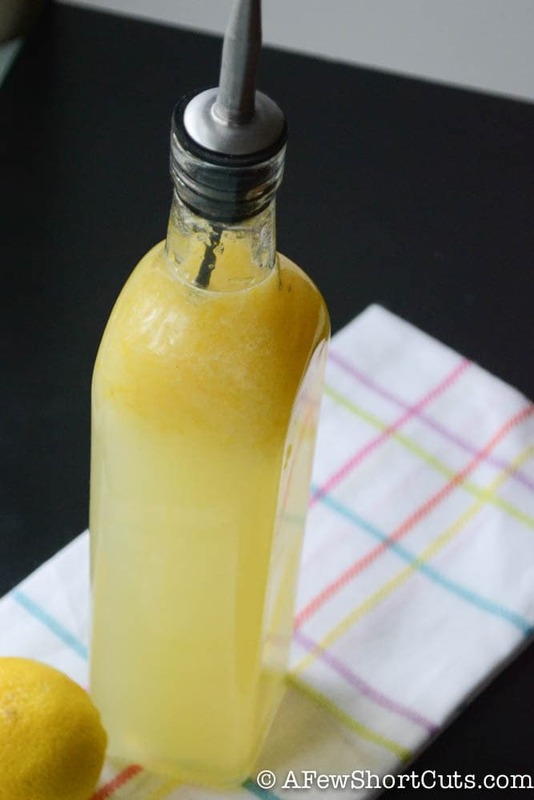 This Homemade Lemonade Syrup looks amazing! Your labels are so cute, your daughter is so creative!! Thanks for sharing your recipe…looks yummy! Pinning this!! This sounds delicious and easy! 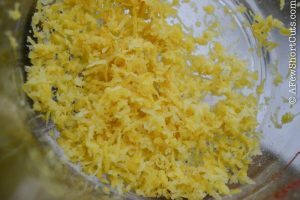 My meyer lemon tree has a bunch of little lemons on it right now and I can’t wait to try them in this recipe. thanks! Pinning this! My daughter will love making it! This is such a great idea, Amanda! I will be trying this recipe! 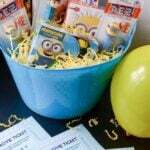 Thank you bunches for linking up and partying with us! Pinning this! This sounds amazing! I love anything lemon! Visiting from i hear nap time – thanks for sharing and pinning! Hope you have a great weekend! good for a nice glass of lemonade. I am so going to try this! I would love it if you joined and contribute your awesome posts at my link party at City of Creative Dreams, starts on Fridays 😀 Hope to see you there at City of Creative Dreams Link Party. This is such a brilliant idea! Thanks for the recipe, I’ll have to try it! And your daughter’s labels are so cute! I can’t wait to try your Lemonade Syrup, this looks great! Hope you are having a great week and thanks so much for sharing this awesome recipe with Full Plate Thursday. 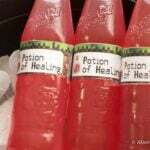 Looks so good and refreshing! About how many lemons did it take to get 3 cups of juice? This is the most insanely genius idea. My husband has been doing hard manual labor in the yard all day. A nice fresh glass of lemonade is just what the doctor ordered! Thank you so much. Yes, it totally can 🙂 PS….I wish I had that problem! I luv this syrup! Perfect for control of more or less. Everyone can make their glass of lemonade to taste! Thank you for sharing.